Well, all those directions alluded to some trail directions. basically there is the hang glide hill road to the top of one hill off 91. This continues as a trail at the top to Spruce pond from which you can follow the directions above and ride the Morgan Hill Rd. to the top and the trails up there. There are also some trails off the road to teh right. All of which go to the top of Tinkers Falls which if you don't take the first one, which is a nasty off camber path that isn't rideable, but take one the two following marked trails, these are some beautiful descents to the top of the falls, really fast steep narly stuff. When you come to the big root watch out! You'll see. From the top of the falls it is a tricky portage up the other side, and then it is a even longer portage to the top of the hill, yet another narly downhill in the opposite direction. From the top there is probably the nicest fastest most incredible trail to Shackham Rd. and the second parking alternative in directions. All right, from the top of Morgan Hill there is the lean to trail that takes you to Shackham Rd. It goes through a gully, back out, down a screaming section of singletrack and across a forest rd. and down to the creek, up the other side to the lean to and then a super rooty technical downhill, a small clmib at the end, across the foot bridge, and up the hill to Shackham Rd. If you go left on the trail off of Morgan Hill, it goes to the top, and hooks up with a handicap truck trail. Where a road splits off to the left there is a trail just down to the left that is new and not authorized yet. Very nice new tight singletrack with some log stunts and steep climbs. This leads back to Eaton Hill Rd. If you continue on the marked Onondaga Trail that you started from on Morgan Hill Road you will follow the handicap truck trail and watch for a marker to the left that cuts back to the truck trail and on to another marker that starts a beautiful rolling singletrack section that crosses the power lines and up the hill and ends at a road. The hiking trail continues, but it isn't worth biking. follow the trail you just rode back. note the power lines, they have a truck trail that is really steep, and it leads to Eaton Hill Rd. where you can trun left and come back to Morgan hill Rd. A good option in wet conditions. morgan Hill is magical in that even when wet, it is rarely muddy for more than some short sections especially neat Spruce Pond. This area has huge ups and downs, some of my downhill/freeride friends do shuttles between Morgan and Shackham Rd. Not a bad idea. Review: Hey guys, I rode this today. Its in good shape, and is being actively worked on by CNY Dirt. Their facebook page has a trail map. That will be the easiest way to find it. Finding the trail wasn't that easy the first time. Review: A lot of potential but also a lot of mystery here. For me Morgan Hill has been a sort of Indiana Jones search. I hear rumors and whispers from other mountain bikers of "16miles of awesome singletrack," "No it's actually more like 25miles," "no it's over 30miles! "....you get the idea. My trouble is I cannot, for love nor money, find a map of this place that is even close to accurate. Someone seems to be maintaining and building trails - The Syracuse MTB club (CNY DIRT), perhaps? Anyway, I've ridden trails Red3 & Red6 and Blue1 & Yellow1 for a total of just over 6miles; hardly the 15-25miles folks keep raving about. BTW: the preceding trails are really nice singletrack so major kudos to the builders, whoever you are! I would give this place 4 or 5 stars, but without an accurate map it's just a great big random black box. Getting there: I tend to park at the corner of Morgan Hill rd and Eaton Hill Rd (Google it), you can pickup the red and blue trails here. I have heard there are trail heads by Labrador Pond off of Rt91, but all I have found is hiking only trail. Good Luck! 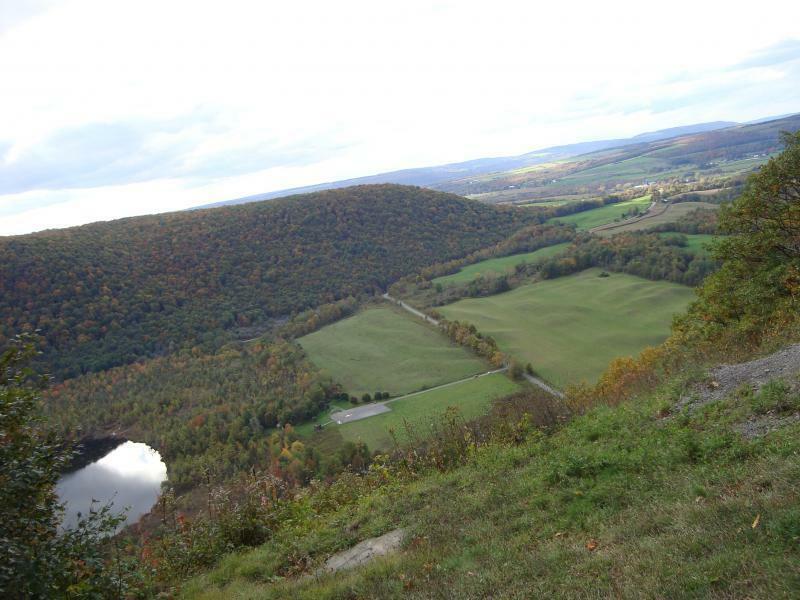 Review: If you want a nice fast downhill, ride up shackham road and take a left onto the finger lakes trail toward tinker falls. Go up a ways then it will flatten out and you can start riding there. The top is flat and fast but there is a lot of logs over the trail. This leads into a gnarly very fast winding downhill that ends at the top of tinker falls. Review: Great riding. Similar to shindagin in the big woods feel. If you know how to link it right this place is amazing. There is WAY more than 15 miles of trails. Awesome place to ride. 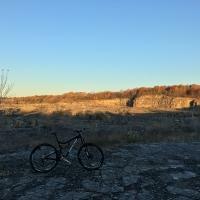 Review: So I'm new in Syracuse and wanted to try this trail out. Using the directions from the written ones, I'm pretty sure I found the trailheads they were talking about. Problem is it seems to be closed off to biking. They only allow foot travel now. The trails I'm talking about are the ones off of Shackham rd. by Shackham pond. Also I drove on morgan hill rd which is just a dirt road and wasn't able to find any starts to trails...so i just rode around on morgan hill rd then to eaton hill rd and still couldn't find any. I know the previous reviewer mentioned them revamping the trails, which I think they may have but then closed to biking. If anyone one could (hopefully) correct me on this and that I just missed the trails that allowed biking would be great. Otherwise this trail system is no longer biker friendly and I wouldn't recommend making the trek out there and driving/biking around for no reason. Review: This is going to be (was) a fun trail with some nice pumping sections and good technical descents/climbs. The scenery of the trail is enjoyable alone as it travels from hardwoods through softwoods and back. The trail is currently being "revamped" as it has been abandoned for a few years now. I would suggest parking at the trail head off of Eaton Hill Rd. or at the end of Morgan Hill Rd. unless you really enjoy allot of biking on dirt roads. Morgan Hill MTB Trail 4.20 out of 5 based on 6 ratings. 6 user reviews.